Washington (CNN) - We can keep your secrets just fine, Mr. President. 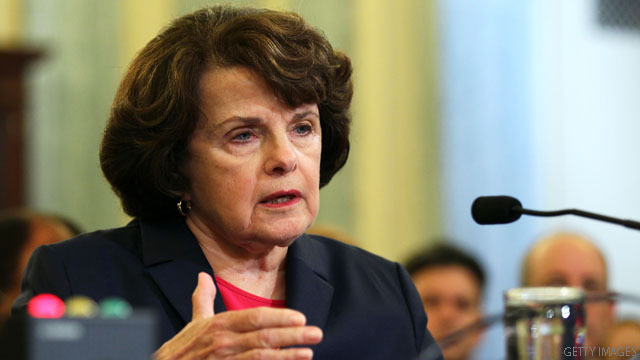 That's the message Sen. Dianne Feinstein conveyed to reporters Sunday, responding to questions about whether President Barack Obama's decision not to inform Congress about swapping five Taliban detainees at Guantanamo Bay, Cuba, for U.S. Army Sgt. Bowe Bergdahl had any merit. In explaining his decision, Obama said the exchange "required no publicity," implying that the legislative branch couldn't be trusted with word of an impending deal to recover Bergdahl, whom the Taliban had held since 2009. The National Defense Authorization Act requires the administration to provide 30 days' advance notice to Congress of a transfer of Guantanamo detainees. "We're briefed all the time on operations one way or the other," Feinstein said. "We keep to ourselves." She added, "There are no leaks." Feinstein, who chairs the Senate Intelligence Committee, also expressed doubts about the administration's assertion that Bergdahl's life would have been put in danger had news of the deal gone public. Sen. Angus King, an independent from Maine, told CNN last week that defense officials informed senators during a classified briefing that "there was a reasonable chance Bowe Bergdahl would have been killed" had the negotiations leaked. Feinstein said she was not aware of any evidence indicating such a possibility. “I've heard of none," she said. "I'll put it that way." The White House also justified its move by saying Bergdahl's health was rapidly declining. Senators were shown a video of Bergdahl, which the administration has said shows the soldier's deteriorating condition. Those who attended the briefing left with mixed opinions, with some saying Bergdahl looked sick while others speculated he was drugged. Feinstein, however, said Bergdahl’s improvement since his May 31 handover to American forces and subsequent hospitalization at a U.S. military facility in Germany leads her to believe his condition was not life-threatening. "I think his rapid recovery, which seems to be happening, which I'm grateful (for), indicates that perhaps he wasn't close to death," she said. ONCE AGAIN! One of OUR "elected misfits" who do not realize that, as we have & continue to see, CANNOT keep anything secret! How many times now have we heard the old & tired, "Name not given because they were not authorized to speak about the subject"? SECRETS for OUR country have become a joke! Until you start putting some of these "leakers" in jail nothing is going to change! Yeah he's done nothing. The DOW was 6,800 when he came in. It's 16,000 now. He saved the Auto industry. Unemployment is down. I now have affordable Health Care. He got Bin Laden. Yeah, what a loser. The GOPT, heck they shut down the goverment bless their hearts. @"Butcher": can u explain how your Republican heroes are doing anything for anyone besides their own power-hungry selves? Do you actually believe your own spew or are you just being a good little partisan lapdog? I think partisan hacks like yourself(and from both sides) are destroying the country, feeding on our divisions for personal gain. You're a sick person if that's all you have to offer. Congress can not keep secrets. A prime example is the SEAL team being outed by a member of Congress despite the fact SEAL team members are supposed to have no face/name to attach for operational safety now and in the future. Congressional members will leak secrets for power over opponents or just to mess up opponents. It is a slippery slope when people say some secrets should be revealed and others hidden. Exposing corruption and abuse of power is a valid reason to expose secrets, but to be spiteful and cause arguments in order to advance someone's or a group's power is not valid. The Pentagon Papers is a prime example of information being classified and secreted away that when revealed showed people that the government will lie for years to save careers and reputations. In today's environment blowing the whistle on anything similar will put in extreme legal trouble, for example Edward Snowden revealing unconstitutional actions and he as a consequence having to flee since he would be branded a traitor for exposing the truth.